I have a love and hate relationship with Apple developer documentation. Official documentation about NSOutlineView class and delegates are very good examples. Sometimes it is a real pleasure to follow their published information and design code and applications. But, from time to time, starting up a very basic, simple example and, further on, getting your more complex project on track is a nightmare. I agree, maybe documentation should not be devised with the beginner in mind. In the end, there are tons of books and examples [maybe] on the net to help a novice grasp some elementary concepts. But I did a thorough search on net and first pages with links provided by Google have, mostly, very complex examples that might be a bit difficult to understand. Moreover, some of the methods required are very poorly explained and these are critical to make some controls work and to actual do things you’d expect from it. This is the first part of a series I intend to maintain on NSOutlineView class, implementation, examples and other how to’s. Most of the information included is based on my previous experience using this class and some advices that I dare to consider for the newbie that wants to get fast to some results. Second in series can be accessed here. 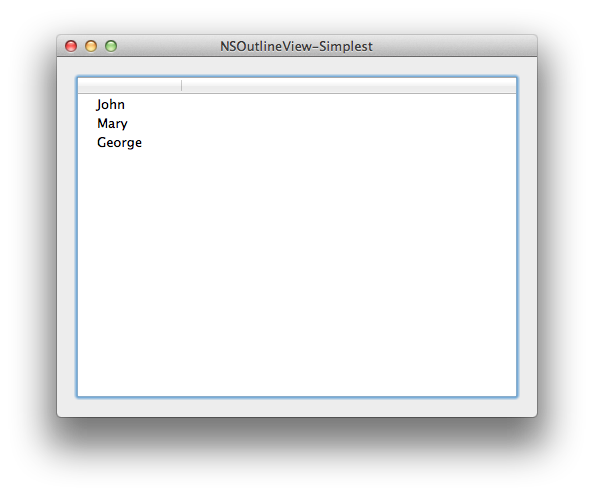 NSOutlineView is a subclass of NSTableView that uses a row-and-column format to display hierarchical data that can be expanded and collapsed, such as directories and files in a file system. A user can expand and collapse rows, edit values, and resize and rearrange columns. In the example above – which is the structure of one of this article’s examples, revealed in Finder – the triangles can be clicked to expand or to collapse the corresponding folder, allowing the user to show or hide the contents of the folder. Such an hierarchical tree of items is usually called a TreeView widget. In Cocoa, this is what it is called NSOutlineView. Please note that if one removes the indent for each level in the hierarchical example above and also the expand/ collapse functionality, the result will be a one column table with a number of rows equal to the number of folders (nodes) and folder entries (children). 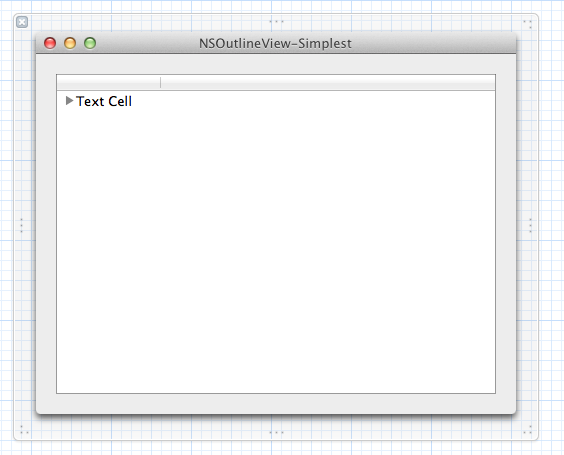 Accordingly, NSOutlineView is a special case of a table, of NSTableView. The idea behind NSOutlineView is that it gets its data from a data source. Rather than pure data, the data source is a class that conforms to a protocol for providing data items, i.e. specific methods mandatory (well… kind of; will discuss it in another post) to be implemented on order to provide and display the data items. You cannot feed directly a data structure, you have to create an object from this structure and use this object to populate the outline view. The data source hands the items to the NSOutlineView. The data items themselves should be instances of a generic class that is derived from NSObject. Implementing the class for the data items might be harder than implementing the data source for the NSOutlineView. Notice that I have included a simple NSLog check that will be called only within the debug build of the app. This is also handy to prove the following point: you will be tempted to add the above code snippet in the applicationDidFinishLaunching of the NSApplicationDelegate method, created together with the project in AppDelegate.m. Don’t. Even if your data source will be initialized, nothing will show in the NSOutlineView. The reason will be discussed in another post. Whoops ! What happened ? As said the outline view is asking here for a child of a particular item. But what is the “item”? Well, it will soon turn out that the “item” depends on the context, that is why the object type of the argument is anonymous (id) since can be anything: an array, a dictionary, a string or an integer. For the scope of this specific method, the item is the data source itself, the dataSource array or the “root” object. Since we do not request here any children of this item, based on the index, the actual result looks like empty because we haven’t requested any children but just the root. In other words, we can test whether a specific item is a root entry if that specific item is nil. The “nil” designation is dependent on the NSOutlineView class context and does not mean that the actual object is empty or void of any content, just that is a “root” object, within the outline view perspective. Of course, clicking on the disclosure triangle will reveal nothing (and in some cases might crash your app quite spectacularly) because each entry in the outline view is, actually, nil – a root entry. In my opinion, understanding NSOutlineViewDataSource Delegate protocol methods is the most difficult thing in mastering this cocoa UI component. As we will progress in more complex examples, you will find that it is also very powerful. That’s it for now. Try it for yourself with several different changes in the code and see what the results are. Next articles will build upon these basic steps. It is unbelievable for me to witness that this post ranks second in Google search for “NSOutlineView”. Frankly, I don’t understand how this happened because I haven’t put any effort in SEO and the time I have to update this blog is very limited. However, I think that — probably — there is a tremendous interest in the community for this class and for its subtleties. So I decided to put some more effort in completing the rest of the initially–intended series. Right now I am working on a series of articles on NSOutlineView inheritance and customization, usage of delegate methods and some advanced topics like optimization and debugging. However, this takes some time. In my opinion it does not make any sense to write something if you are not able to bring some improvements or clarity in the concepts already there on the Net or — at least — to help other programmers to have a better understanding on the underlying requirements and intricacies of some classes in order to be able to develop in a shorter amount of time and with less pains modern, useful and performant software. So I will bring my respect to all those that made this second on Google and will finish what I started. Thank you all. 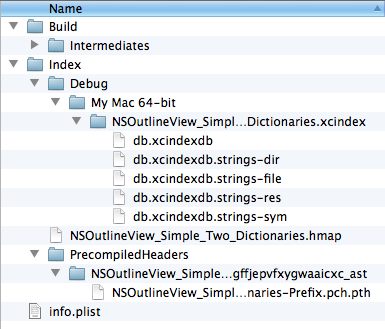 Filed in Apple Programming, How To's, Most commented, Most viewed, Tutorials and tagged NSOutlineView. Bookmark the permalink. Hi, did you ever get round to posting the next articles? I lack soooo much the time ! 🙂 I promise I will do the in a week or so. Great! If you have any thoughts about using the “new” source list too that would be very helpful! Actually I found this class one of the most difficult to grasp. My initial intention was to write a series on NSOutlineView implementation so, for sure, details on the updated class will follow. Thanks for your comments. Thank you, Emanuel, for visiting, reading and commenting. As said, given the interest this topic stirred, I will update the series. Stay tuned. Very nice and clear tutorial. Looking forward the next part 🙂 thank you! Thank you, Szabolcs, for visiting, reading and commenting. Stay tuned. Next will come soon. Second article in the series available here. Enjoy. What I forgot to mention in my comment on the second part: There were some additional steps in part one I had to do in order to get it work under Xcode 4.6. After the first & run, there is only an empty outline view. I had to connect the NSOutlineView (INSIDE the NSScrollView, not the NSScrollView itself) to the App Delegate as “datasource”. Later on I had to change the identifier of both NSTableColumn to their according values. I hope this helps everyone who stumbled there. Hi, Awado, thanks for your comment. You’re right, there are some steps that I did not show in the tutorial. I was [wrongly] assuming that these are known — like second nature: connecting the outlets, data source etc. However, for the sake of completeness, I will update the article with these steps too. Much appreciated your feedback. I’ve followed your tutorial to the letter, three or four times over, and the outline view is always empty. Perhaps your tutorial no longer works with XCode 5? Hi, Kyle. Thank you for your comment. This sounds like the Outline View does not have its datasource connected. Are you sure you did this ? This tutorial is fairly simple and there were no such major changes to the underlying framework to make it obsolete. Recheck the outlet connections. Let me know, please. Hi, Kyle, getting back on this: I have tried the project on Mavericks with Xcode 5.1.1. It works perfectly.